The Christmas tree (julgran) for inside the home has been cut from the forest, left to dry outside a bit, then brought in to be decorated with lights, strings of Swedish flags, and ornaments handmade from wood, straw and strong red thread. The Julbock (Christmas goat) stands guard beside the tree. In the days just before Christmas Eve all the other Christmas decorations (julpynt) are placed around the home and in the windows. Each year we put poinsettias in every window on either side of the Adventstakar (seven light candle stands) . We tape the outer edges of our 1800's windows to thwart any drafts and hope the flowers will bloom for us throughout the entire season into January. These three angels holding their candles have such sweet porcelain faces, each one with a different expression. We washed and ironed their dresses and they looked so crisp and pristine on the mantlepiece of the kakelugn (ceramic fireplace) in the TV room. One Sunday afternoon, on the way home from church just after Advent, our family stopped at one of the many outdoor Christmas markets that are held in the countryside at this time of year. Papa had always wanted Nainy to see one so they walked around to look at the displays. A woman who made these elaborate straw and thread decorations was from a village north of Örnsköldsvik. Since it was a Sunday, we had only come to look, not to buy, but Papa contacted her several days later and he and Nainy went to her workshop and brought home beautiful straw/thread decorations, some that would hang from the ceiling and some that were smaller for doors and windows. On the homefront, it was a busy time. The house must be cleaned from top to bottom. Julstäda - a verb that means "make the place clean and tidy for Christmas" certainly applied to us. The kitchen floor which is made of natural, untreated wood planks, is scrubbed by hand with såpa (pronounced 'sorpa'), a thick, yellowish glue-like cleaning substance made from linseed oil and spread on one small area at a time. Then a stiff brush soaked in water is used to scrub the floor and lastly it is wiped with a clean, wet scouring cloth. Here Gustav does the scrubbing and Elder Blaylock, one of our full-time missionaries from Virginia, does the rinsing and wiping. The floor was absolutely gleaming when they finished. Elder Harris, from St. George, Utah, did a manful job of monitoring the woodstove! The main house (storstuga) at 8:50 A.M. the morning of Christmas Eve. "When the time for ACTION comes, the time for PREPARATION is over". When the morning of Christmas Eve arrived, the time for ACTION had definitely come. We were PREPARED. It was a glorious morning, right off a Christmas card, and thanks to our two visiting daughters, Louise and Sophia, who outdid themselves with all the Christmas cooking, we had a glorious meal! The Advent season starts on the fourth Sunday before Christmas in Sweden. The first candle is lit in the evening and then each succeeding Sunday another is lit until all four are burning. The Advent candle holder above with it's soft brass finish and painted ornaments is from Hans' childhood. He has kept it polished and repaired and it is a lovely feeling to display it each year. Advent is a wonderful time for all of us as we look forward to celebrating the coming of the Son of God to the earth. It is exciting for the children and filled with warmth and festivities for everyone as the countdown to Christmas Eve begins. 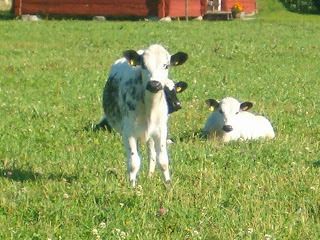 Swedish traditions here on the farm make the Christmas season a most peaceful time, surprisingly devoid of much of the hustle and bustle. There are lights everywhere - on tables, in windows and on the Advent tree - and even the animals in the barn seem to feel the sweet spirit of the season. The boys brought over all the Advent decorations that we had packed away last year and stored in the lillstuga. As we unpacked the boxes we were glad that we had taken the time to label each one carefully as the decorations that are used for Advent come first and the other decorations are not put out until much later, closer to the actual Christmas Eve. It was a snowy day and once the boxes were unloaded they had to be taken back. Here is a display of "balance extraordinaire" as they carry the empties back to the lillstuga until after the holidays. Pretty amazing...they didn't drop one! Saffranbullar and pepparkakor (saffron buns and ginger cookies) are a must and should be ready for the beginning of the celebration period as they are eaten traditionally all throughout the holidays. We have the world's most delicious recipes for both saffranbullar (from Ebba Henrikson, a dear family friend in our small village of Eden) and pepparkakor (from Hans' mother, Birgitta Metzen, that she made each year) so this year we started early to be totally prepared! In the ICA grocery store the little tiny packets of saffron are kept behind the counter by the cashier because they are so precious and extremely expensive, but we are told that even the most modest household will have saffranbullar....it is such an important part of the feeling of Advent. We had fun making the "S" shaped rolls and poking in the raisins. Here they are glazed with egg wash and ready to go into the woodstove for baking. With the pepparkakor dough we have made angels, gingerbread men and women, reindeer, bells, Swedish goats, etc. We even found a magazine article showing how to decorate both regular and oversized pepparkakor in the Swedish style. We are going to see if we can find the time to try that later in the season with the super big cutters that we found unexpectedly in a store in Örnsköldsvik this year. Most exciting of all is to see the farm and the beautiful Advent tree all lit up....an event that is to take place before midnight on the first Sunday of Advent. This is the most beautiful tree any of us can remember having and it has caused quite a buzz in our village and also in Junsele and other villages round about. Many have driven out to Eden just to see the "Karlsson Adventgran". We are so thrilled to have it and to have others experience the joy of it as well. With golden lights glowing in every window it is a breathtakingly beautiful sight and we are filled with gratitude for our life here. We wish you a wonderful Christmas Season! Are there monkeys on the farm? Q: Grandpa Hans and Nainy - are there cows on the farm? A: Yes, Honey, there are cows on the farm. Q: And are there 'sheeps' on the farm? 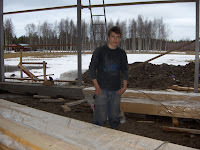 Because we are a historical farm and are raising a breed of cow that was almost extinct only one generation ago (Fjållkor - Mountain Cows), the European Union and the Swedish Government provided a partial grant for building a much needed new hay barn/machine hall. 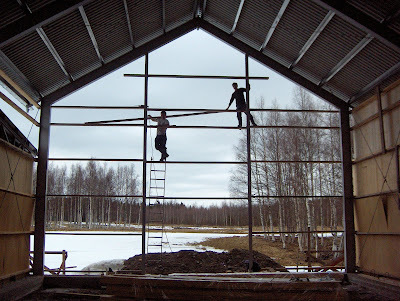 While Papa was away, Manny and Gustav had the task of covering the metal framework with wooden slats. It was cold and wet with snow still on the ground in late Spring, but they started right in. Each day after school before they lost the light and on Saturdays they worked on completing the new complex so that it could be used for hay storage and the winter housing of animals in the coming year. The lower level extension off to the left is the machine hall where vehicles/machines can be kept "under roof" during the winter months - a real necessity in the cold, wet climate of northern Sweden. Here is the progress by the end of August last year. Still to be added is another steel section that comes forward of the large barn where the tractor is parked, and on the left hand end a bay somewhat larger and taller than the machine hall bays. 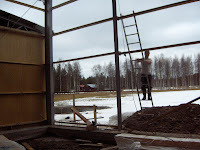 It will be used for the storage of wood for the winter. 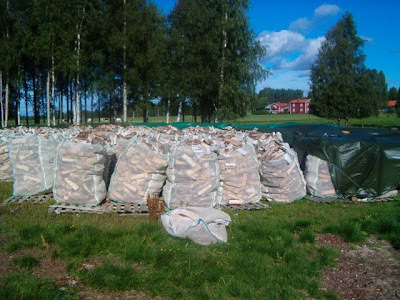 Currently the wood is in large net bags on pallets outside and must be covered with tarps for protection while still allowing air to pass through for the essential drying process. With winter upon us now it has been so wonderful to be able to put away the implements and vehicles safely in the bays and set up a shelter for the sheep within the new building. By next haying season (summer 2010), we are hoping to have it completed to the point that we can use it for overflow hay storage and then later on as a facility where the cows can be "stall-free" during the winter days. Are there monkeys on the farm.......?"